I’ve been meaning to start my third pregnancy diary ever since I first got those blue lines back in March. But the thing that I’m quickly discovering is that when you get to a third pregnancy you don’t really have much time to think about being pregnant! Week 16 coincided with half term. And also a trip to Rotterdam with Bonn to attend a blogging conference. Not exactly time to stop and put my feet up. Rotterdam was amazing fun, but the trip really made me realise just how much I need to listen to my body and slow down a bit. We took a bit of a roundabout route to get to Rotterdam. We were late to sort flights so instead decided to take the ferry and save money. I’m so glad we did as it was so much more relaxed than flying. I liked being able to get on when we were ready and having a cabin to retreat to. Sleeping in bunk beds was absolutely fine although the early morning arrivals did mean daytime naps were necessary. I’m a huge fan of ferry travel though and there will be a post and video about the journey very soon over on Penny Travels. For the conference itself I really realised the benefit of a good comfortable seat. My back was killing me at the end of some of the sessions. I also quickly discovered that whilst The Netherlands are fantastic for the availability of non-alcoholic beer, they don’t have much by way of decaffeinated tea or coffee. Luckily those handbag supplies of decaf Yorkshire Tea was very much appreciated! One of the best things we did was buy travel card equivalents for the tram network. It meant that we could just jump on the tram for short journeys which was so invaluable with it being about 28 degrees most days. Our days were quick packed with the conference schedule but we still squeezed in a spot of sightseeing between the naps and talks! 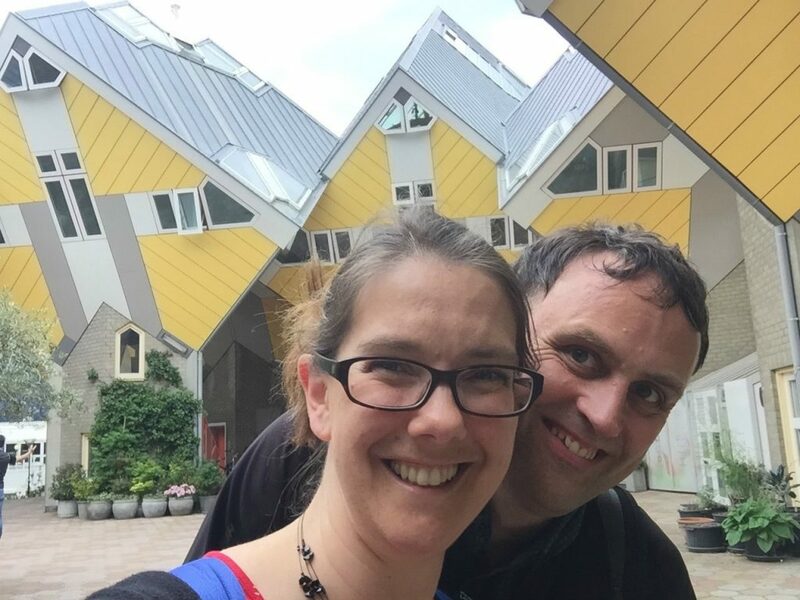 When we got back from Rotterdam my kids and step-daughter came to stay for the rest of half term. My mum also came for the last weekend, although a full house meant she stayed in the hotel at the end of the road! It was lovely having a long chunk of time with the kids, but boy did it make me miss them when they went back to school and their Dad’s on Monday. It was also so much help having Mum to stay. Things like the washing up and the laundry just happened and I was able to properly put my feet up for a bit. Whilst we popped to town to sort out some mobile phone contracts in town she got all the kids doing a spot of gardening too. I really need to learn how she actually gets them to do what she tells them to do – as I seem to fail at that. We had some great days out too. 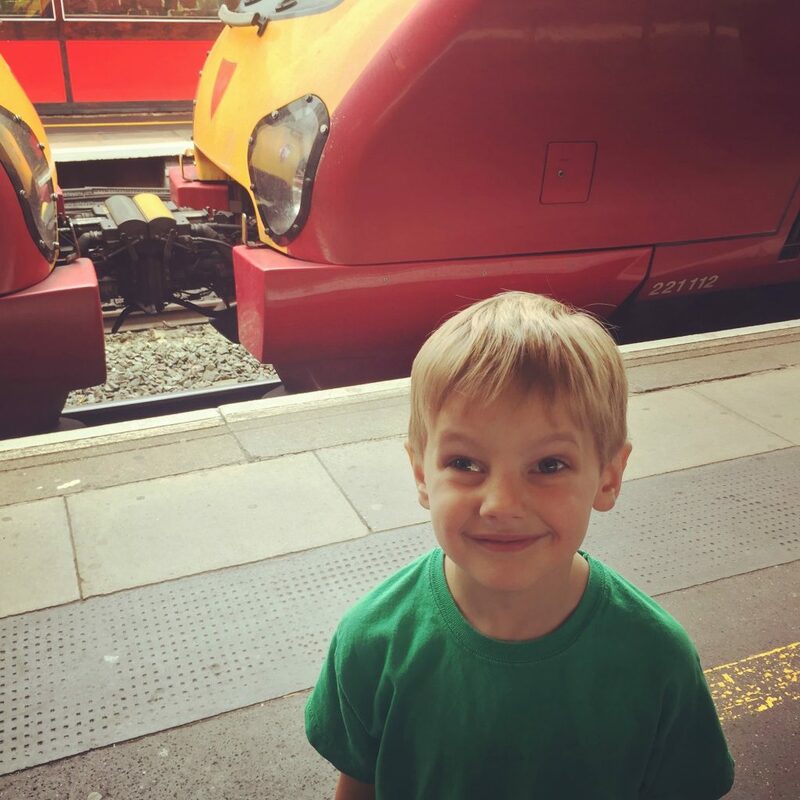 Whilst Little Miss C was at technology camp one day, Master C and I did a day of train travel. He’s been desperate to go on a Pendolino for ages, so we managed to fit in a trip from Watford to Coventry. A good couple of hours were also spent watching trains at both Watford Junction and Coventry stations. He had an absolute blast, and it was lovely to spend some time just the two of us, but I was shattered when I finally got home. All six of us spent a lovely day at the National Trust’s Waddesdon Manor too. We got gorgeous weather and the kids really enjoyed the playground there in particular. The hour it took us to go round the house was a bit like hard work on my back, but Mum enjoyed seeing it for the first time and the kids also enjoyed the children’s trail around. 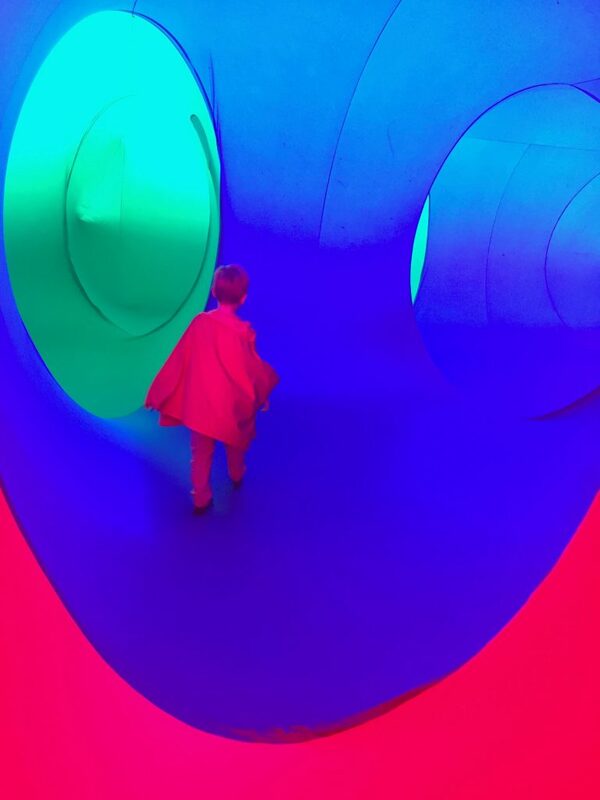 The highlight of the day was a visit to Colourscape in the grounds. It’s one of the hardest things to explain, and strangely one of the best explanations possibly can be found on Wikipedia. It’s basically a large inflatable structure of 56 interlinking chambers, where each one is a different colour. 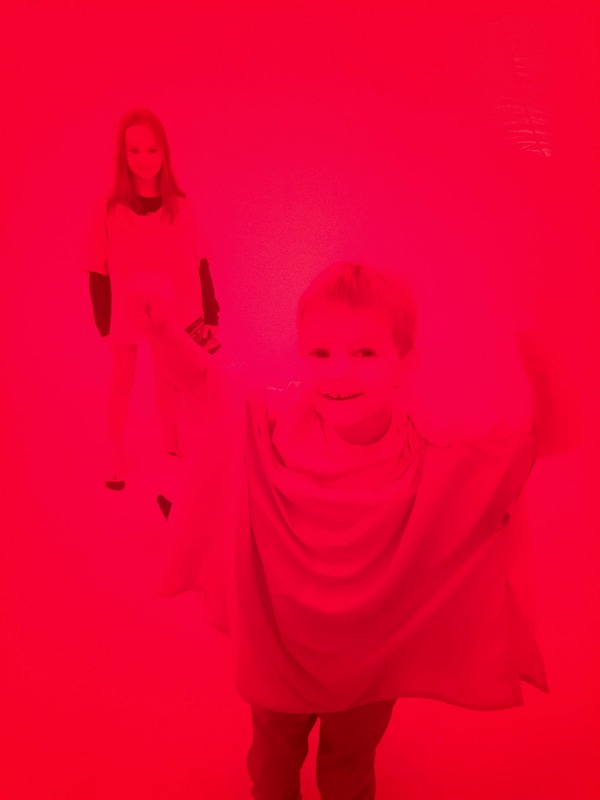 Visitors go in barefoot and wear a coloured cape as they wander around. In our case there was also musicians in one chamber and their music was piped around the whole structure. It’s probably worth a whole blog post in itself, but it was in short an amazing experience. If a somewhat bizarre one! The colours make everything look and feel so different. Slightly trippy I guess. It makes for some fantastic photographs though. And I loved the fact that everyone from five year old Master C up to his Granny thoroughly enjoyed themselves. The queuing to get in was hard work for my back, so so worthwhile. And that, in a flash, was week 16. Basically a week in which the main reminders of being pregnant were back ache and the need to nap! Oh, and Master C trying to insist that I drink 4 pints of milk a day as he’s concerned that I’m not drinking enough for the baby to get enough. Bless him!